It’s been awhile since I’ve seen one, but in the days of my youth it was not uncommon to see behind the pulpit a baptistry with a painted scene of the Jordan River. I had no need of such a scene. I was baptized in a real river. The Yamhill River at Camp Yamhill’s Inspiration Point. And the water was cold. And I liked it! But if you had to do an indoor baptism, I could see the appeal of pretending that the water was living water. And what better river to be baptized in than the one in which Jesus was baptized by John the Baptist. In our imaginations, we have always connected our baptism to Jesus’. Which, when you think of it is kind of odd. The words spoken over me at baptism were, “In the name of the Father, the Son, and the Holy Spirit, I now baptize you for the forgiveness of sins that you might receive the gift of the Holy Spirit.” These words hardly apply to Jesus, the one without sin. My baptism is not like Jesus’ baptism. Well, even though he didn’t need it, I was told, Jesus submitted to it to provide an example for us. If it was good enough for Jesus, it should be good enough for me. The upshot of all of this is that Pentecost and Peter’s call to “repent and be baptized” became the paradigmatic scene for me and many like me. Or, the language of Romans 6. Lydia, Cornelius, or the Philippian jailer were my predecessors, not Jesus. So, why the Jordan River scenes? I’ve been looking again at the various accounts of the baptism of Jesus in the gospels, and I am convinced that Jesus was baptized for the same reasons we should be. I’m also convinced that Jesus’ baptism is more than just an example. I’m convinced as well that even though he was sinless and I’m not, his baptism should be the model for my own. And I’m convinced that Acts 2 and Romans 6 should be read in light of that baptism and not the other way around. So, for that to be the case, two things have to happen. We have to understand Jesus’ baptism differently. And we have to understand our own in new and fresh ways as well. So, here’s the big point I want to make which I will support in subsequent posts. Jesus was baptized to demonstrate his solidarity with the coming Kingdom of God. Not only that, but his baptism was a demonstration of the nature of that coming kingdom. These are the same reasons we are baptized. What about forgiveness of sins? Forgiveness of sins is part and parcel of the new age, of the coming Kingdom. Of course it would be associated with an act like baptism. But as we’ll see, this is less about the forgiveness of individual sinners and more about establishing the conditions necessary for the restoration of all things. Clearly, this view of things will challenge the predominant way the gospel has been understood the past few hundred years. But take a deep breath. What I hope to demonstrate will not throw out what you currently believe about salvation or baptism, but enlarge it and put it more squarely within the overall scope of the biblical narratives. I promise, you won’t feel the need to be re-baptized as a result of these posts (if you do, I’d suggest that the problem is on your end). And I think we’re on better theological footing when we model our participation in faith on Jesus rather than Cornelius or Lydia. 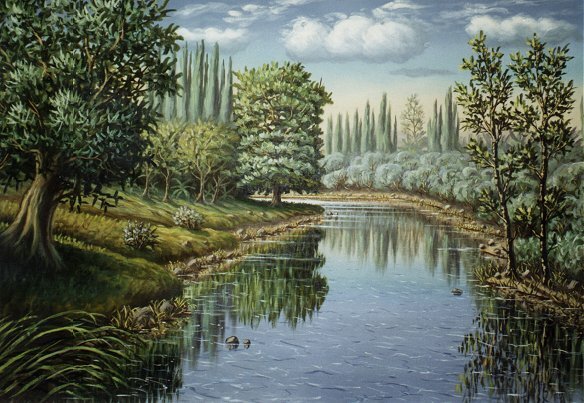 Maybe we will see a rebirth of Jordan River scenes in our new church buildings. This entry was posted in Uncategorized and tagged baptism, baptism of Jesus, eschatology, Jordan River, Kingdom of God. Bookmark the permalink. Interesting post…. two quick comments: (1) There is a really good section in Chapter 6 of NT Wright’s “Paul and the Faithfulness of God” on the subject of baptism saying that, for Paul, baptism was more about a sign of entering into the community of the church, i.e. a community-defining symbol (so that a paraphrase of Romans 6 might be, you are part of the people who have been through the new Exodus, you have been through the waters, so count yourself as set free from the slavery of sin). Difficult to summarise several pages in one comment, though. 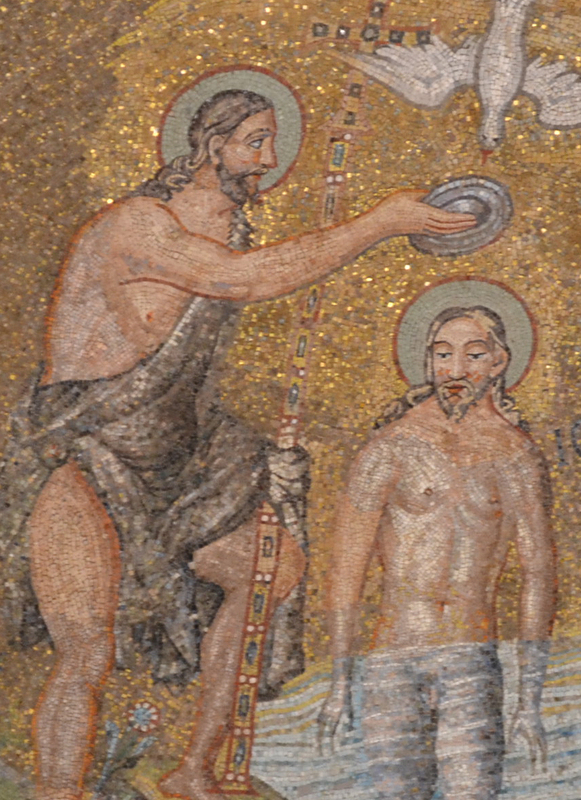 (2) There was a really nice mosaic of the baptism of Jesus in an old church we visited in Ravenna last summer. It amused my children especially, because Jesus was depicted as very much naked! Daniel, I will be arguing similarly to Wright and undoubtedly influenced by Wright. And, Ricky Bobby prayed to Baby Jesus, not nekid Jesus. OK, sorry for the spoilers! Mosaic picture is here… with apologies to Ricky. I’m curious about the baptistry image you used here. Do you know where it is? Carisse, I just googled Jordan river baptistry and this image came up. I didn’t note where the painting actually exists, but I’ve seen it before in baptistries. 1 Peter chapters 1-3 seem to be making the same point about Israel becoming transformed into the Kingdom of God (through baptism), especially in 2:4-10, “… you are a chosen race, a royal priesthood, a holy nation, a people for God’s own possession…”. We don’t even begin to think that the waters of the flood saved Noah and his family. That water was death. And “corresponding to that” the water of baptism is a symbol of death according to Romans 6:3 (All of us who have been baptized into Christ Jesus, have been baptized into his death.) It is not the water of baptism that saves us, but a conscious choice on God’s part to forgive us, because we choose to obey Him by choosing to submit to baptism. Logan, nice catch on 1 Peter. That strengthens my argument. I think the same point is being made in Rom 6. We are being transferred from one kingdom to another. Here is another approach. The Jerusalem mob has killed the promised Messiah and it is in deep trouble. When addressing Jerusalemites, the indictment reads “You” (2:23; 3:14-15; 7:52); elsewhere the Jerusalem crowd gets the blame (Acts 10:39: 13:27-28). With a single exception, Acts 2:38 is filled with plural word-forms–y’all repent . . . forgiveness of y’all’s sins . . . y’all receive Holy Spirit. This crowd is bad.Any implicated individual who hopes to escape God’s judgment must make a clean break with the murderous mob and and stand instead with its latest victim–not simply as a victim but specifically as Israel’s rejected Messiah. This time singular: each one of you be baptized in name of Jesus Messiah. Peter hammers the point: “Save yourselves . . .” From what? “From this perverse generation” (Acts 2;40). That is how baptism “saves.” It separates one from the evil crowd. Peter likes the imagery, and he uses it again later. Noah and family were saved by water (1 Pet. 3:20-21). You mean from the water. No, by water–from the wicked world. And this is the sense iln which baptism saves us (3:21)–it separates us from the world under judgment. So step away from the evil mob. Take a stand with Jesus. Let the water show the difference. God sent Jesus into the world not to condemn it. But to save the world from the darkness and grief of death. The water of baptism kills the human who is a slave to life and all sorts of rulers because s/he lives in fear of death and life itself. The human that is reborn through baptism in the name of the Father, the Son and the Holy Spirit is free to live a full life without fear of dying. For in dying the person of faith is born into eternal life. Jesus was sinless, because Jesus accepted and trusted the Cross and the man who carried it as if they were his very own father and sister (Mark 15:21). Jesus did not reject Simon the Rock (aka Jesus of Nazareth and Simon the Cyrene and Simon the Pharisee) that the chief builders rejected. Nor did Jesus reject the Cross as an exceedingly bitter truth to hide or cover up. Jesus the Rabboni faced up to the exceedingly bitter truth and admitted that he and his sister (aka the Red-haired one) and Simon were sinners. They did not keep all the Mosaic commandments. Facing the Truth and freeing her to go and tell, frees both from prison and from the grave and allows both of them to appear before Simon her pharisaical father and his… as children of God whose eternal bond of love and relationship full of truth and grace prove eternal life(John 20:17).